To Cite: Esmaeilzadeh A, Erfanmanesh M, Ghasemi S, Mohammadi F. Serological Assay and Genotyping of Hepatitis C Virus in Infected Patients in Zanjan Province, Hepat Mon. 2014 ; 14(9):e17323. doi: 10.5812/hepatmon.17323. Background: Hepatitis C Virus (HCV), a public health problem, is an enveloped, single-stranded RNA virus and a member of the Hepacivirus genus of the Flaviviridae family. Liver cancer, cirrhosis, and end-stage liver are the outcomes of chronic infection with HCV. HCV isolates show significant heterogeneity in genetics around the world. Therefore, determining HCV genotypes is a vital step in determining prognosis and planning therapeutic strategies. Objectives: As distribution of HCV genotypes is different in various geographical regions and HCV genotyping of patients has not been investigated in Zanjan City, this study was designed for the first time, to determine HCV genotypes in the region and to promote the impact of the treatment. Materials and Methods: Serum samples of 136 patients were collected and analyzed for anti-HCV antibodies using ELISA (The enzyme-linked immunosorbent assay) method. Then, positive samples were exposed to RT-PCR, which was performed under standard condition. Afterwards, they investigated for genotyping using allele-specific PCR (AS-PCR), and HCV genotype 2.0 line probe assay (LiPA). 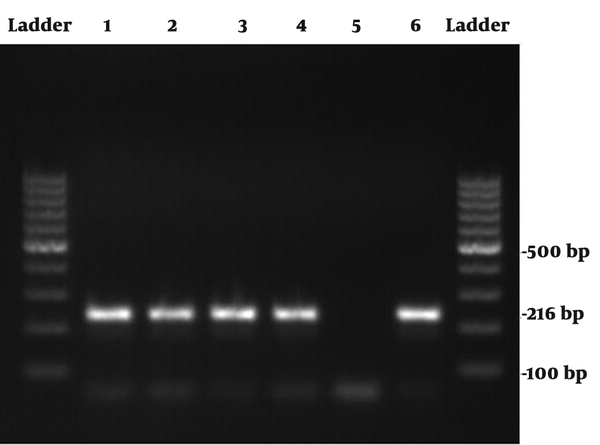 Results: Samples indicated 216 bp bands on 2% agarose gel. Analyses of the results demonstrated that the most dominant subtype was 3a with frequency of 38.26% in Zanjan Province followed by subtypes of 1b, 1a, 2, and 4 with frequencies of 25.73%, 22.05%, 5.14%, and 4.41%, respectively. The frequency of unknown HCV genotypes was 4.41%. Conclusions: According to the results, it was found that HCV high prevalent genotype in Zanjan is subtype 3a. Analysis of the results provides identification of certain HCV genotypes, and these valuable findings could affect the type and duration of the treatment. Hepatitis C Virus (HCV), a worldwide blood borne infection with a global importance, is a significant cause of hepatic diseases, cirrhosis and hepatocellular carcinoma, after hepatitis B which its screening was introduced in blood banking laboratory methods (1-5). Chronic infection with HCV is a major cause of liver cancer, cirrhosis and end-stage liver in the world (6-8). It has been estimated that more than 170 million people are infected worldwide, and approximately 280000 deaths are attributed to chronic hepatitis C virus (HCV) infection each year (9). In the future prospect, deaths caused by HCV infection will be tripled over the next 20 years, especially in the developing countries (10). The HCV is an enveloped, single-stranded RNA virus and a member of the Hepacivirus genus of the Flaviviridae family (11). The heterogeneous rate varies significantly in different areas (12, 13). Analysis of the different HCV genomic sequences has ascertained that the virus nucleotide sequence can be different as much as 30% (14). HCV virus has been divided into seven major genotypes (HCV-1 to HCV-7) (15). Also, each genotype is divided into multiple subtypes (e.g. 1a, 1b, etc.) These genotypes have different distributions in different geographical areas (16, 17). Since the genotype is a critical baseline predictor of the response to HCV antiviral therapy, determination of such a genotype is very important (8, 18). Genotyping is necessary to predict the response rate and duration of the treatment (10, 19). By improving HCV therapy, HCV genotyping has become very useful, because the patients who need more aggressive management are helped for screening (20). Prevalence and incidence of the virus vary depending on the area of conflict (17, 21). Iran is located in the Middle-East. The rate of HCV infection in Iran is high for its geographical situation and huge immigration from Afghanistan and Iraq (5). Recent findings have shown that genotyping pattern in Iranian patients is comparable with Western Europe and North America, which constitutes genotypes 1 and 3. Despite the similarity of the distribution, these genotypes vary in different areas (22). Given the above-mentioned findings, HCV genotyping in each region is of great importance; nonetheless, this study has not been performed in Zanjan, a province in North West of Iran. In this research, we evaluated the genotypes of the HCV in Zanjan. Identifying the most common type of genotype can help these patients. Not only the cost of the treatment can be minimized, but also the length of the treatment can be optimized. The purpose of this study was to offer an applicable prospect in the therapeutic context by identifying HCV genotypes in Zanjan Province, the Northwest of Iran. From 2007 to 2013, out of the patients who referred to the Clinical Laboratory for investigating anti-HCV antibodies, 136 patients with positive results were selected using anti HCV antibody ELISA kit (4th generation) (Anti HCV ELISA, DIAsource, Belgium) for further investigations. About 5 mL of plasma (EDTA) for blood samples was stored in -20°C for the following procedures. RNA was extracted under standard conditions using CinnaGen Diagnostic kit (CinnaGen Company, Tehran, Iran). In brief, cDNA was synthesized as the template for PCR reactions in the first round of PCR. Reagents with final volume of 45 µL added to each tube on ice, containing 39 µL Mix I, 1 µL RT Enzyme, 0.3 µL Taq DNA Polymerase, and 40 µL Mineral oil. After mixing well, RNA tubes were placed at 95°C for one minute, then placed on ice. Five microliter RNA of each patient, positive control and DEPC (Diethylpyrocarbonate) water were added to each tube for patients, positive and negative control, respectively. The mixture was centrifuged for 3-5 s and then placed on a cycle of 42°C for 20 min, 94°C for 2 min, 60°C for 40 s and 72°C for 40 s. Next step comprised 20 cycles of 93°C for 40 s, 60°C for 40 s, 72°C for 40 s based on the manufacturer's instructions. The second PCR round included the expected fragment 216 bp amplification under the condition mentioned in the kit, including 35 cycles of 93°C for 40 s, 60 °C for 40 s and 72°C for 40 s (Flex cycler-Germany). Final 216 bp of PCR product was diagnosed using agarose gel electrophoresis detection system on a 2% agarose gel. The samples were evaluated for HCV genotyping by using allele-specific PCR (AS-PCR) (23), and HCV genotype 2.0 line probe assay (LiPA) (Versant HCV Genotype 2.0 Assay [LiPA], Siemens, Germany). Result analysis of gel electrophoresis on PCR products, indicated a 216 bp band for each positive sample as shown in Figure 1. Genotyping results demonstrated that subtype 3a (38.26%) was the most prevalent HCV type in Zanjan. Prevalence of subtypes 1b, 1a, 2, and 4 were 25.73%, 22.05%, 5.14%, and 4.41%, respectively. Also, the frequency for unknown genotypes was 4.41%. 1-4, Four HCV positive patients; 5, Negative Control; 6, Positive Control. Genotyping of HCV has been regarded as a fundamental factor for treatment, prognosis, and prediction in clinical management (24), so that to begin the treatment and then follow up are in accordance with the virus genotype (25). The length of the therapy is also influenced by genotype (14). Recent studies have shown that the distribution of HCV genotypes varies in different geographical regions. Thus, determination of the predominant and less prevalent subtypes of HCV in various areas has a fundamental role. The interest for identifying HCV genotypes is increasing worldwide (25). This study was the first report of HCV genotypes prevalence in Zanjan (the Northwest of Iran). This study analyzed 136 HCV positive samples for genotyping in the region. The results indicated that subtype 3a with the frequency of 38.26% was the most current subtype in Zanjan. This finding was consistent with a recent study performed in Tehran (a city near Zanjan) (22). It was also comparable with the obtained results reported (25) from Azerbaijani patients (in West Azerbaijan, Northwest of Iran) with established chronic hepatitis C, who referred to some hospitals in Tehran (26). This similarity may be due to the proximity of Zanjan with these cities. A study in Shiraz, a city in Southern part of Iran estimated the prevalence of HCV genotype to be similar in the case of 3a type (8). Meanwhile, another comprehensive investigation performed in Tehran with a wide range of infected patients referring from all over the country has introduced subtype 1a as the most prevalent subtype in Iran (27). Additionally, in a study in Isfahan (Iran) and on the bases of other reports, high prevalence of subtypes 3a and 1a and very low frequency of genotype 2 in Iran was demonstrated, which is different from Europe, USA, and even some parts of Asia (28). HCV subtypes 3a and 1a were determined in the hemodialysis patients living in Tehran as the prevalent subtypes (29). This finding is in contrast with global HCV genotypes prevalence (30) and the high frequency of genotype HCV 1a/1b in addition to HCV 4 and HCV 2/2a plus HCV 4 in hemodialysis patients living in the neighboring countries such as Bahrain and Saudi Arabia (31), which have sea borders with Khuzestan Province in Ahvaz. In addition, evaluation of chronic hepatic patients indicated 1a as the most prevalent subtype in Hormozgan (32). On the whole, genotype 3 was more prevalent in regions such as India, Pakistan, and Southern Asia (33-35). In both Saudi Arabia and Egypt, genotype 4 was the predominant genotype (25). In most parts of China, subtype 1b followed by 2a was found with high prevalence (36, 37). In a study in Chile (among blood donors), subtype 1b with the frequency of 46% was the dominant type (38, 39). A research in central Italy was reported genotype 4 as the prevalent genotype (20). Gonzaga RM et al. investigated the distribution of hepatitis C virus genotypes in seropositive patients in Brazil in 2008 (40). The prevalence of different HCV genotypes in the world are as follows: subtype 1a is mostly reported in North America and Europe. In Southern and Eastern Europe, Japan, and North Africa, the mostly reported subtype is 1b. Subtype 2c is common in Northern Italy. Encountering subtype 3a from South East Asia in Europe and the USA may be transmitted by travelers. Subtype 3a may be transmitted from South East Asia in Europe and the USA by travelers. Genotype 4 is highly common in Arab countries except Jordan while in Turkey and Israel genotype 1 were prevalent. Genotype 5 is highly common in South Africa. Genotype 6a is restricted to Hong Kong and Vietnam (41). In conclusion, paying attention to high prevalence of a certain HCV genotype is essential in remedial terms of HCV. It could affect the therapeutic methods and duration. Determining HCV genotypes could increase the chance of successful treatment. To obtain more precise information regarding the genotype of this virus, we recommend larger study population of patients. The authors would like to thank Zanjan Noor Clinical Laboratory for providing the samples and lab facilities and also Keivan, Bahar, and Noor laboratories in Tehran for their services such as providing genotyping results of some patients. It is necessary to appreciate all the staff of the laboratories for their help and sincere cooperation. Authors' Contributions: Abdolreza Esmaeilzadeh designed and supervised the project and professionally edited the manuscript. Erfanmanesh, Sousan Ghasemi, and Farzaneh Mohammadi contributed in writing the article and collecting the data. Funding/support: The samples and lab facilities have been provided by Zanjan Noor Clinical Laboratory.